Global Asia Blog | Scotland to stay in the EU? Brexit is sparking the need for independence in Scotland once again. We all know about the decision of the British people to leave the European Union but not every nation that is part of the United Kingdom wanted to leave the EU. Scotland and Northern Ireland voted to stay and over 60% of the Scottish people do not want to leave. Figure 1: Difference referendum Brexit between Scotland the rest of the UK (Asperia, 2016). This fact is motivating the pro-independence and currently leading Scottish National Party, to hold a second referendum on independence of the United Kingdom. A second referendum on independence you ask? Yes a second one because only 4 years ago there already was a referendum on independence among the Scottish population in which the voted to stay. It is natural to ask oneself why a second referendum should be held if the people already decided quite recently to stay in the UK. The reason for this is because one of the primary reasons the Scottish people voted to stay part of the UK is due to it was argued back then that it would be really hard to re-join the EU since it will leave that at first as well. However, now everything is different because the United Kingdom and therefore Scotland would leave the EU due to the Brexit, this could persuade the majority of the Scottish population to leave the UK and re-join the EU. Scottish independence could be financially beneficial or devastating from different perspectives. From the perspective of the European Union and every other nation in it, it would be very beneficial for Scotland to declare independence and re-join the EU. This naturally means that it would be devastating for the remaining countries in the United Kingdom since they would lose another important trade partner. The real question of which the answer would have a great influence on the outcome of the second Scottish independence referendum is what would be best for the Scottish economy. To understand the desire for Scottish independence we have to go back in time, back to the 1707. This was the year in which the Act of the Union happened which fused the kingdoms of England and Scotland into Great Britain. Before this, Scotland had been a nation on its own for centuries and therefore caused decades long riots for independence across Scotland. The need for independence became more prominent a little over 50 years ago when British Empire started losing its overseas territories rapidly and finally resulted in the end of the British Empire. The humiliation that was felt across the British isles for no longer being the global super power it was for hundreds of years made the cry of independence become more fierce among the Scottish population. This became clear with the first devolution referendum that was held in 1979 which would increase the autonomy of Scotland and would allow Scotland to have its own parliament. This referendum was won by the Unionist who desired Scotland to remain a territory of Great Britain. However, a second devolution referendum was won overwhelmingly by the Scottish nationalists back in 1997 (Harvie, 2004). 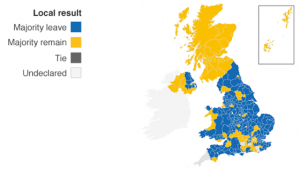 In 2014, a referendum for independence was held in order to led the Scottish people decide whether they truly desired independence or in the end still wanted to remain part of the United Kingdom. After the results came in it became clear that the No Party (the side that wanted to stay in the UK) had won with a significant majority, namely 55%. The Yes Party (the side to wanted to be independent) accepted the outcome and it seemed that at least for the coming decades a new cry for independence would occur. The main reasons that resulted in the No Party winning was the uncertainty about what would happen to Scotland after it became independent, especially when it came to joining the EU afterwards and how quick this could be done. Another important point was the uncertainty about the type of currency that would be used when independent (Keating, 2015). Figure 2: Outcome Scottish independence referendum 2014 (The Guardian, 2014). As explained before, the strong desire Scotland has to remain part of the European Union in combination with the fact that staying part of the European Union was a main reason for the Scottish population to vote against independence back in 2014. This could lead to a new referendum about independence in Scotland in the near future and if they decide to leave the United Kingdom, would that be good for the economy of Scotland? – Border Business: The businesses that are located near the English border are naturally doing business in England and independence would promptly disrupt it. – Currency: Scotland would want to keep the Pound Sterling but would the UK allow that? The other options are to get their own currency or join the Euro but that would both cause confusion and disruption in the Scottish economy. – Lengthy EU procedure: It normally takes years for a country to join the EU due to the long procedure it has. This means that after declaring independence, Scotland will not be part of the EU at first and therefore be out of both the internal market of the UK and the EU which will hurt the economy naturally. These are challenges that the Scottish economy will have to face while there are no immediate improvements expected (Wilcox, 2018). One can ask his- or herself, would it be worth for Scotland to become a sovereign state? The short term implications which are likely to happen indicate that the country will have a rough time adjusting when becoming independent which means that in the beginning the economy will be face some severe challenges while there are no certainties for a better economy on the long term. For this reason, it will not be wise for Scotland to become independent from an economic point of view. Thank you for reading this blog! Please comment your opinion about my blog and do not be afraid to start a discussion about it! Especially if there are any Scottish or other British people among you, please share your point of view to start or enrich a conversation! Harvie, C. (2004). Scotland and Nationalism (4th ed.). New York, United States of America: Routledge. Tagged Brexit, Independence, Referendum, Scotland. Bookmark the permalink.